Here is something sweet to round out the meal. 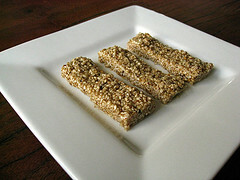 Use equal weights of honey and sesame seeds. In a heavy skillet bring the honey to a very firm ball stage (250° to 256° F). Stir in the sesame seeds and continue cooking until the mixture comes to a bubbling boil. Spread the mixture 1/2″ thick on a marble slab or tray moistened with orange flower water. Cool and cut into small diamonds or squares.